Nomenclature: Named after the ancient Greek word beryllos which means "a green stone." 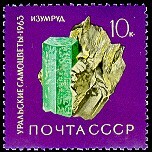 Additional Notes: Several varieties of beryl exist, which are based upon the color of the material. The green variety of beryl is emerald; the greenish-blue, blue, and bluish-green variety is aquamarine; the pink to pale violet-pink variety is morganite; the yellow variety is heliodore; and the colorless variety is goshenite.